Mary Landis is a native Coloradoan. As a farm girl Mary had a natural love for the outdoors and started drawing and painting at a very early age and continued throughout her adult life. 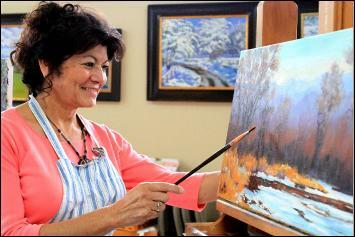 Mary changed careers to fulfill a lifetime dream of making art and becoming a professional artist after spending many years in the business profession. Her inspiration and creative energy comes from the Rocky Mountain and Southwest regions and any subject matter that sparks her interest. Her favorite place to be: plein air painting on a beautiful day with oils or pastels. Participation in national and local exhibitions, volunteering for community art programs and teaching art classes keep her busy in the art world. She has received numerous awards and her art works are distributed in personal and corporate collections throughout the United States, Canada, Brazil, France and Mexico.